Our choir is well known throughout the Lakeland area for providing fantastic music. But that doesn’t mean that we are all professional singers! We are casual and have lots of fun, we have singers at all levels, and we sing all kinds of music – from traditional to contemporary, gospel to spirituals, classical to modern, and so on. During the Christmas and Easter seasons, there are extra programs, special music, and numerous singing opportunities. Anybody interested in singing is welcome to join our choir. If you are curious about the choir and you like to sing, we invite you to join us during any Thursday rehearsal – and see what you think. No audition necessary. Rehearsals take place Thursday evenings from 4:00-5:30PM in the church. In addition, we have a brush-up rehearsal on Sunday morning at 9:30AM. 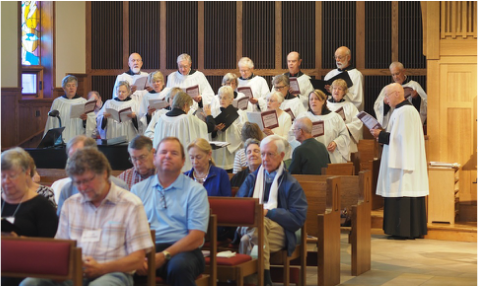 We welcome visitors, summer residents, and permanent residents to be part of the choir. Because we are in a tourist community, our summer choir is much larger than our winter choir! Since we have a fluid community size, we try to accommodate that influx of singers as much as possible. The choir sings most weeks (we take a short break for a few Sundays after Easter) but we don’t require weekly attendance. If you are interested in singing, just show up at church for a rehearsal, or speak to a choir member, an organist, or sign up at right. Or use the form for feedback or requests! Fill out this form and you will be contacted.